Hopper Division Winner(Qualifies our team to compete on Einstein): Celebrates the team or alliance that wins the division. Regional Winner(Qualifies our team for the Championship Event): Celebrates the team or alliance that wins the Regional competition. 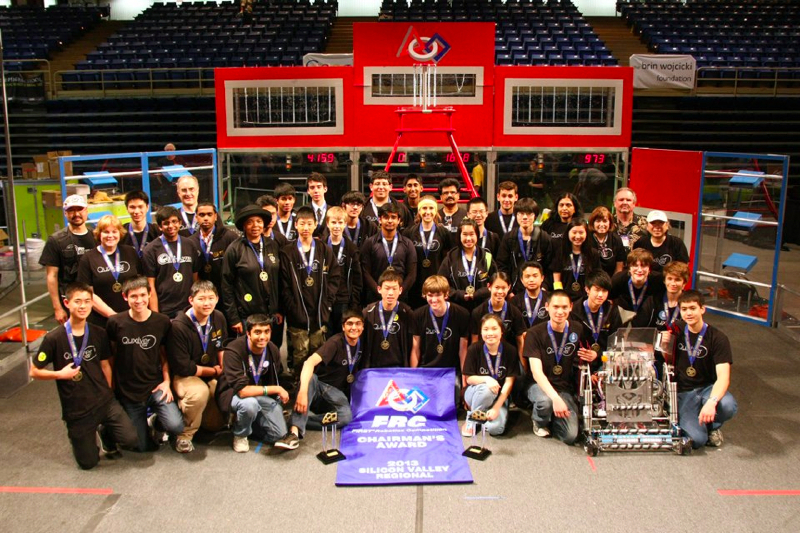 Finalists: This Regional Finalist celebrates the team or alliance that makes it to the final match of the competition. Safety Award: Celebrates the team that progresses beyond safety fundamentals by using innovative ways to eliminate or protect against hazards. Winner: This award celebrates the team or alliance that wins the competition. Regional Finalist: This Regional Finalist celebrates the team or alliance that makes it to the final match of the competition. Regional Chairman’s Award (Qualifies our team for the Championship Event): FIRST’s most prestigious award, it honors the team that best represents a model for other teams to emulate and best embodies the purpose and goals of FIRST. 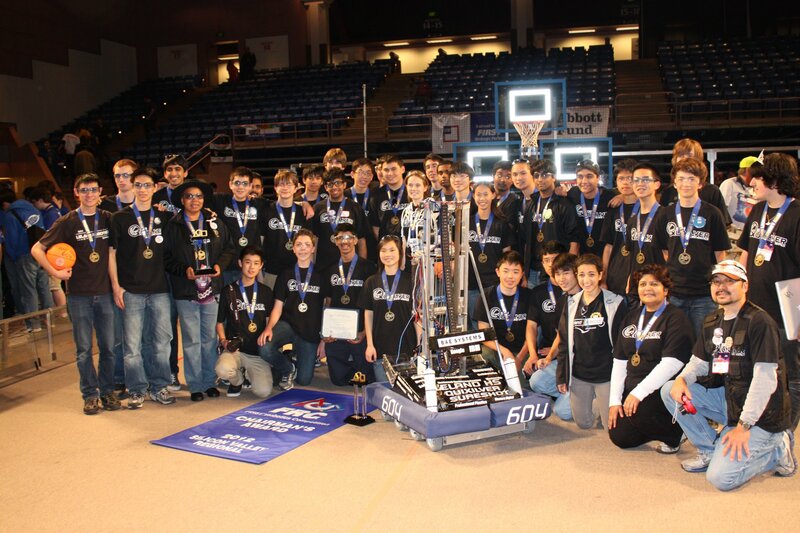 The award helps keep the central focus of the FIRST Robotics Competition on the goal of inspiring greater levels of respect and honor for science and technology. Wow Factor Award: The Wow Factor Award celebrates the team that was able to make the biggest impression to the judges. Madtown Throwdown: Judges Award: During the course of the competition, the judging panel may encounter a team whose unique efforts, performance, or dynamics merit recognition. Quality Award sponsored by Motorola: Celebrates machine robustness in concept and fabrication. Woodie Flowers Finalist Award — Mr. Best: The Woodie Flowers Finalist Award celebrates effective communication in the art and science of engineering and design. Dr. William Murphy founded this prestigious award in 1996 to recognize mentors who lead, inspire, and empower using excellent communication skills. The Woodie Flowers Finalist Award is presented to an outstanding engineer or teacher participating in the robotics competition who best demonstrates excellence in teaching science, math, and creative design. Entrepreneurship Award: Fielding a successful and sustainable robotics team is a multi-faceted endeavor, requiring engineering, management, and business skills. While the team displays its engineering skill on the game field, other skills are essential to getting there. The Entrepreneurship Award recognizes a team that demonstrates a business organization and execution that can help its team succeed on the field. Teams submit a demonstration (e.g., essay, business plan, examples, etc.) to the judge; teams will be interviewed for this award. Runner-up AMD CAD Award:Teams will submit examples and descriptions of their use of CAD in robot design or other aspects of the robotics competition prior to the competition. Judges will review these examples, discuss them with the students on a team, and review the implementation of the design. This award recognizes exceptional use and connections from CAD design to implementation, showing where CAD made a difference. Woodie Flowers Finalist Award — Mr. Mori: The Woodie Flowers Finalist Award celebrates effective communication in the art and science of engineering and design. Dr. William Murphy founded this prestigious award in 1996 to recognize mentors who lead, inspire, and empower using excellent communication skills. The Woodie Flowers Finalist Award is presented to an outstanding engineer or teacher participating in the robotics competition who best demonstrates excellence in teaching science, math, and creative design. Dean’s List Finalist — Kunal M.:This award celebrates outstanding student leaders whose passion for and effectiveness at attaining, FIRST ideals is exemplary. The Kamen family hopes this honor not only recognizes these student leaders’ tremendous recent accomplishments, but also inspires them to continue their great work for FIRST as alumni. FIRST Dean’s List Finalists will compete at the championship for the FIRST Dean’s List. Engineering Inspiration Award (Qualifies our team for the Championship Event): Celebrates outstanding success in advancing respect and appreciation for engineering within a team’s school and community. Regional Chairman’s Award (Qualifies our team for the Championship Event): The Regional Chairman’s Award is FIRST’s most prestigious award, it honors the team that best represents a model for other teams to emulate and best embodies the purpose and goals of FIRST. 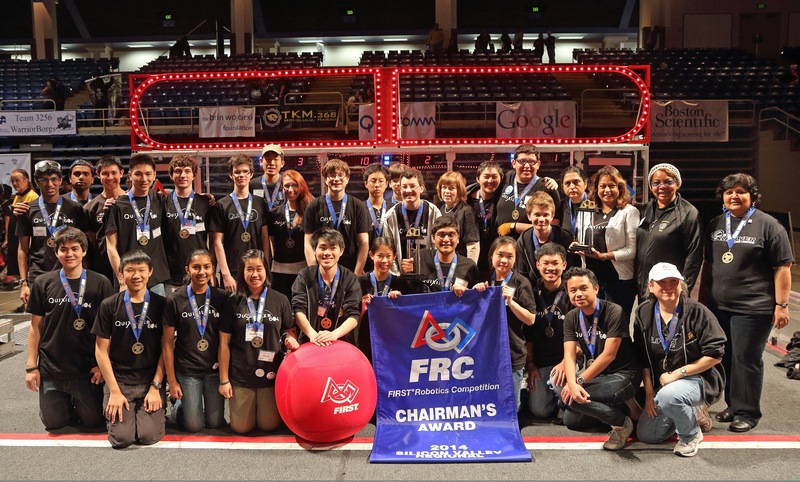 The Regional Chairman’s Award helps keep the central focus of the FIRST Robotics Competition on the goal of inspiring greater levels of respect and honor for science and technology. Woodie Flowers Finalist Award — Mrs. Best: The Woodie Flowers Finalist Award celebrates effective communication in the art and science of engineering and design. Dr. William Murphy founded this prestigious award in 1996 to recognize mentors who lead, inspire, and empower using excellent communication skills. The Woodie Flowers Award is presented to an outstanding engineer or teacher participating in the robotics competition who best demonstrates excellence in teaching science, math, and creative design. Runner-up Abbot Inventor Hall of Fame Award: Celebrates innovation and intellectual property creation inspired by the FIRST season experience. Mentor Award – Mrs.Arrington: An effective mentoring relationship is characterized by mutual respect, trust, understanding, and empathy. Good mentors are able to share life experiences and wisdom, as well as technical expertise. They are good listeners, good observers, and good problem-solvers. They make an effort to know, accept, and respect the goals and interests of a student. In the end, they establish an environment in which the student’s accomplishment is limited only by the extent of his or her talent. Runner Up AMD CAD Award: The AMD CAD Award recognizes a team that shows the judges a quality CAD design that is then implemented in their robot. Regional Champion (Qualifies our team for the Championship Event): This award celebrates the team or alliance that wins the competition. CoopertitionTM Award: The CoopertitionTM Award celebrates the team that best demonstrates the ability to help their opponents compete. In the inaugural year of the Coopertition Award, the award will be granted to the team that earns the most Coopertition Bonus points during the competition. Woodie Flowers Finalist Award — Mrs. Arrington: The Woodie Flowers Finalist Award celebrates effective communication in the art and science of engineering and design. Dr. William Murphy founded this prestigious award in 1996 to recognize mentors who lead, inspire, and empower using excellent communication skills. The Woodie Flowers Finalist Award is presented to an outstanding engineer or teacher participating in the robotics competition who best demonstrates excellence in teaching science, math, and creative design. Dean’s List Finalist — Eugene F.: This award celebrates outstanding student leaders whose passion for and effectiveness at attaining, FIRST ideals is exemplary. The Kamen family hopes this honor not only recognizes these student leaders’ tremendous recent accomplishments, but also inspires them to continue their great work for FIRST as alumni. FIRST Dean’s List Finalists will compete at the championship for the FIRST Dean’s List. Lunacy Champion: Celebrates the team or alliance that wins the competition. BAE Systems Design Award: Winner of this award will demonstrate a unique or exceptional design element to the judges. This element could be in the software or hardware design of the robot. BLADE Entrepreneurship Award: This award recognizes that it takes money to make robots and to compete in FRC year after year. This award recognizes a team that has developed a process to find, foster, and grow funding resources, allowing their team to be successful. This award recognizes more than simple fund raising; it recognizes the team spirit and enthusiasm needed to develop a strong set of sponsor-team relationships. A business plan or display would be helpful. Rockwell Automation Innovation in Control Award: Celebrates an innovative control system or application of control components to provide unique machine functions. Delphi “Driving Tomorrow’s Technology” Award: Celebrates an elegant and advantageous machine feature. Website Award: Recognizes excellence in student-designed, built, and managed FIRST team websites. UL Industrial Safety Award: Celebrates the team that progresses beyond safety fundamentals by using innovative ways to eliminate or protect against hazards. Overdrive Champion: Celebrates the team or alliance that wins the competition. Commendation from San Jose Mayor Chuck Reed and Councilmember Nancy Pyle for the Leland Robotics Team’s outstanding achievements in the field of robotics. Regional Chairman’s Award (Qualifies our team for the Championship Event): FIRST’s most prestigious award, it honors the team judged to have created the best partnership effort among team participants, and to have best exemplified the true meaning of FIRST. The award helps keep the central focus of the FIRST Robotics Competition on the goal of inspiring greater levels of respect and honor for science and technology. Judge’s Award Day 2: During the course of the competition, the judging panel may decide a team’s unique efforts, performance, or dynamics merit recognition. General Motors Industrial Design Award: Celebrates form and function in an efficiently designed machine that effectively achieves the game challenge. Regional Champion (Qualifies our team for the Championship Event):Celebrates the team or alliance that wins the Regional competition. Descriptions by FIRST, WRRF, and FIRST Team 604.